Our top selling bags! 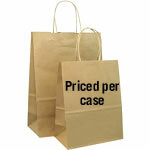 Choose from our basic but effective Kraft or White paper shopping bags. These paper bags are equipped with twisted paper handles that are extremely sturdy and ideal for retail stores or for gift giving. 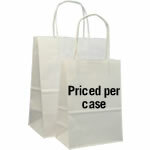 Pricing is offered in both per 100 bags and per case (200 or 250). Save on shipping costs and the environment if you buy per case rather than per 100.